Well I just love this series with the balance between the look at old bones, and often new ones too, with the ongoing drama in Ruth Galloway’s own life along with that of DCI Harry Nelson and the rest of his team. In The Dark Angel rather than Ruth’s boss Phil taking to the television we have an Italian archaeologist who is about to reveal some Roman bones to the audience when something interrupts filming. Desperate to provide some authenticity to his dig and tempt the TV crew back, Dr Angelo Morelli invites Ruth to Italy to lend a helping hand. Ruth is in a bit of a rut, her mother died recently and there has been some other unwelcome news in her personal life and anyway Kate could do with a holiday so she decides that Italy is the perfect answer. Inviting her friend Shona and her son Louis the party board the plane for Italy and Angelo’s apartment in a hilltop village. Meanwhile in Norfolk Nelson is warned that a man jailed for a heinous crime ten years previously has been released. Mickey Webb made some wild threats at the time he was jailed aimed at Nelson but it seems that he has come out of prison a reformed character and one who has found religion, and a good woman to boot. Italy has plenty of history and of course although Ruth is there to look at some Roman bones the party have hardly made themselves at home before they are informed that they are staying in the home of a former hero of the Second World War when Italy was occupied. And this is exactly why I love this series, no matter the crime, and there are I’m pleased to report, there is one, there is so much detail to enjoy on the periphery to the storyline all told in such a ‘chatty’ manner it is listening to a friend. That combined with catching up with the latest escapades which entertain me enormously while bones are tested, theories are expounded and suspects questioned. With events happening in two different countries, both personal and criminal, the action moves quite swiftly despite the somewhat more relaxed holiday feeling to brighten the darker moments in Italy. Elly Griffiths has compiled a great character in Ruth. She is intelligent without being condescending, worried about her appearance but also not overly envious of those with looks. She has turned into a pragmatic single mother to Kate and yet she is no angel – the asides when Louis breaks glass after glass in the apartment provides a wry smile from anyone who has ever had to spend an extended amount of time with a child that doesn’t behave like your own. She has moments of fierce introspection and yet she is obviously a capable and inspirational forensic archaeologist – someone I’m sure would fascinate me if she was a real live breathing person. This is a series where you should start at the beginning as the story arc becomes more and more integral to the enjoyment of the books as the series goes on and to be honest the ‘non-crime’ sections are a bigger proportion in this episode than the previous books but if you are already a fan, you are in for a real treat. I still haven’t read any Elly Griffiths, but the Ruth Galloway series will be a present to myself once I finish my PhD. I have only heard wonderful things about them, and taking into account my love for Bones and everything Ireland, I think I’ll love them. It is a great series (although set in Norfolk not Ireland) and I the Dr Ruth Galloway, is one of those ‘real’ women, a contradiction at times but incredibly capable on a personal and professional level, even if she doesn’t always realise it. I’m thrilled that you enjoyed Anatomy of a Scandal – I was so hoping you’d like the different take to Apple Tree Yard – I’ve done a little whoop!! This is a great series, isn’t it, Cleo? I do like the way Griffiths handles different timelines and explores (at least) two different crimes at the same time. She keeps the plot threads going, and I really like that about her work. And you’re right; Ruth Galloway is a terrific character. It is one of my favourites Margot – I think she’s an amazing author and I like that Ruth Galloway is a ‘real’ woman in that she reflects many of the contradictions that most of us to succumb to from time to time. Haha I do love the justification that us book lovers go through 🙂 And I can give you some good news. 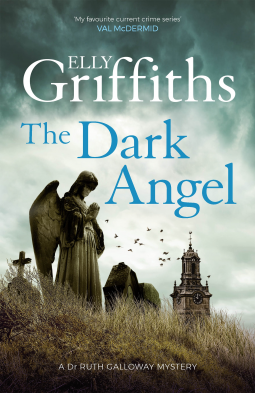 I had a bit of a twitter chat with Elly Griffiths and she says that she’s already writing the eleventh in the series so I have no need to give spoilers although I can say both Shona and her child are in this book quite a lot…. This is one of those series that I have been collecting forever but yet have to read. I need a binge! Do you know Karen I would love to read them all from the start so I’d go for the binge! I love the Ruth Galloway character…but I’ve only read the first two books. Must get busy! Thanks for sharing. Only another eight to go before you catch up! I need to give this series a try! I’ve heard lots of good things about it. It really is one starting there is such a lot of good things between the pages! For some reason Ruth Galloway sounds really familiar, but i’m almost positive I’ve never read a book in this series. Great review!